England's new plastic £5 banknote: Why is polymer better than paper? 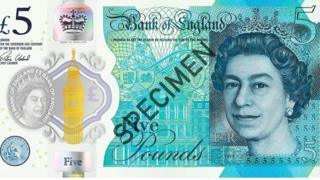 The Bank of England has unveiled the design for the new plastic £5 note. The new banknote will be smaller than the current one and be printed on a thin plastic. 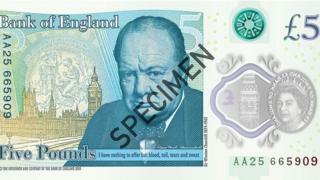 For more than 100 years, English banknotes have been made from cotton paper. Polymer banknotes are made from a very thin, flexible, see-through plastic film, with the design printed on special layers of ink on the front and back. Because the main material is see-through, the design can include clear spots that are like little windows you can look straight through. More than 20 countries around the world already use polymer banknotes - they include Scotland, Australia, New Zealand and Canada. Why is polymer better than paper? Cleaner: Shiny plastic doesn't get wet and dirty like paper. More secure: Features like the see-through windows are difficult to copy, so it's harder for criminals to make fake notes. Longer lasting: Plastic won't tear as easily as paper, so the notes should last longer. They're even expected to survive if they accidentally go in the washing machine, although they'd melt under extreme heat. When will the new note be in use? The new £5 note will be going into circulation in September this year. And it's not just the £5 that's going plastic - polymer £10 notes are planned for 2017, and polymer £20 notes should be available by 2020.